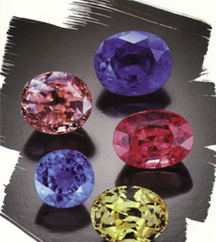 Sapphire, like Ruby, is a variety of the mineral, corundum. Beauty is only one reason to choose Sapphire, another is durability. Most gemstones, including diamond, need enhancement through cutting or treatment to be enjoyed in a piece of jewelry. Since the time of Marco Polo, most Sapphire has been heated to permanently turn it one of the brilliant hues you see. Though one of nature's most durable gemstones, protect your Sapphire from hard blows and scratches by caring for it as you would a fine garment. With proper care, your Sapphire jewelry can be passed through generations. Sapphire is treasured as a gift for September birthdays and a talisman for the sign of Taurus. It is the traditional gift for a couple celebrating their fifth as well as forty-fifth wedding anniversary.